The Commonwealth of The Bahamas is a coral archipelago of around 700 islands and more than 2,000 rocks and cays in the west Atlantic, south-east of the coast of Florida, USA and northeast of Cuba. It straddles the Tropic of Cancer and stretches over 970 km. Climate: The climate is cooler than other countries in the Caribbean region but still pleasantly mild in winter. Winter temperatures average 21°C, summer temperatures 30°C. Most of the rain (averaging 1,100 mm p.a.) falls in May-June and September-October and there are frequent thunderstorms in summer. The Bahamas islands are subject to hurricanes during June-November. Environment: The most significant environmental issues are coral reef decay and solid waste disposal. Population: 347,000 (2011); 67% lives in New Providence, 84% in urban areas; growth 1.4% p.a. 1990-2011; birth rate 15 per 1,000 people (31 in 1970); life expectancy 76 years (66 in 1970). Bahamians are largely of African (85%), Afro-European and European origin, as the indigenous Arawaks were wiped out. 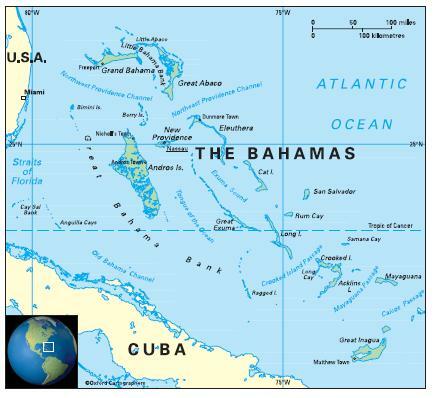 Economy: The Bahamas is classified as a high-income economy by the World Bank.